By Mo Willems. 40 pp. Disney Press. $16.99. Pigeons are notoriously difficult to reason with. And this one appeared to be no exception. Worst of all, the Person in Charge of Removing Uninvited Wildlife was off picking up his car just when I needed him. 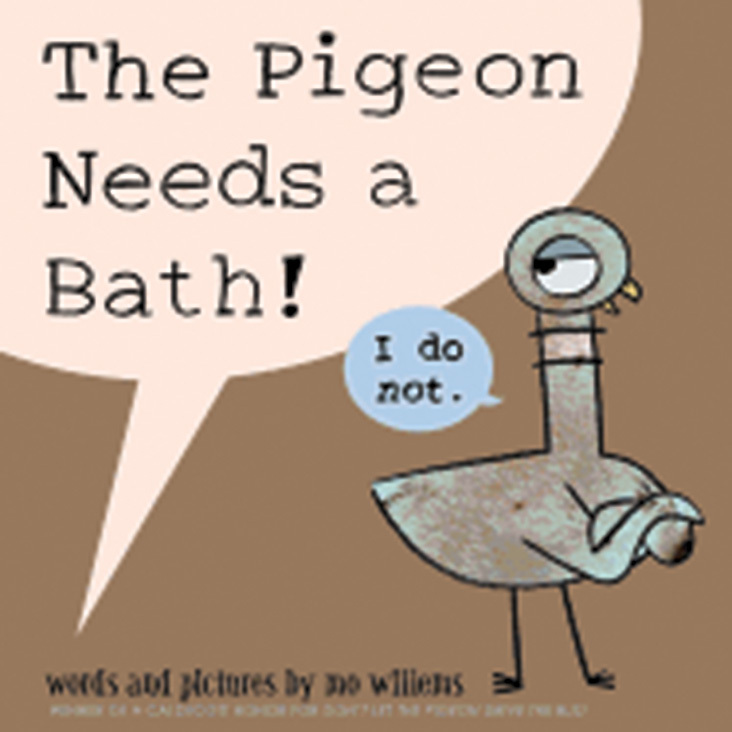 We were alone, the pigeon and I.
I quickly reviewed everything I’d ever read about pigeons, most of it based upon the pigeon books of children’s author and illustrator, Mo Willems. From Don’t Let the Pigeon Drive the Bus, I recalled that pigeons beg and plead whenever they aren’t allowed to do something. “Please!” they’ll whine. “Please!” Then they’ll come up with unworkable compromises such as, “I’ll tell you what: I’ll just steer.” From Don’t Let the Pigeon Stay Up Late! I remembered that if you order pigeons to do something, they’ll propose a long list of alternatives that would be not only fun but educational. (“I hear there’s a good show about birds on TV tonight.”). And from a reading of Willems’ most recent book on the subject, The Pigeon Needs a Bath, I learned that even one’s most earnest instructions are considered, “…just a matter of opinion” by pigeons. Of course, Willems’ pigeons are as wide-eyed and irresistible as a three-year-old. My pigeon, on the other hand, was thoroughly resistible.